The third Cloverfield movie, The Cloverfield Paradox, was unexpectedly released on Netflix Sunday night. It was a landmark moment for film distribution because never before has a film of this magnitude been released without reviews, notice, or promotion. Unfortunately, the film itself doesn’t live up to its historic release. 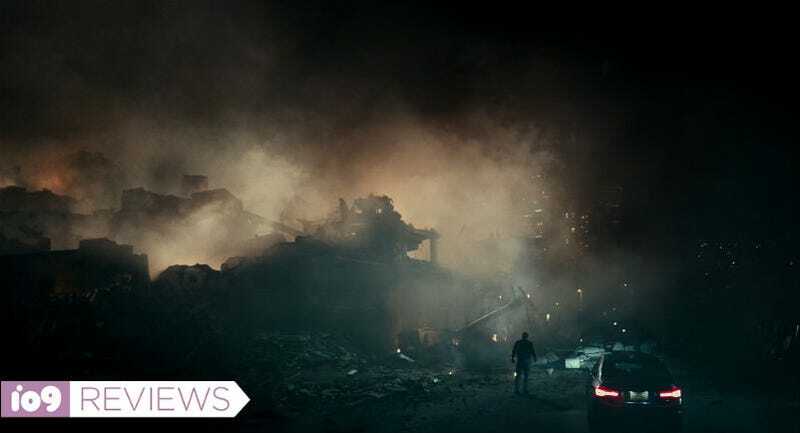 Directed by Julius Onah, written by Oren Uziel and Doug Jung, and produced by J.J. Abrams, The Cloverfield Paradox is set in an unidentified time period when the Earth is on the brink of self-destruction. Energy is needed to survive, so an international team of scientists goes into space to try and create sustainable energy using a powerful particle accelerator. However, the particle accelerator is unpredictable and dangerous, and it ends up, somehow, making the Earth below the space station disappear. Where did it go? How can they get back? Why are all these strange things starting to happen? It’s an intriguing set-up to be sure, and the cast, which includes Daniel Bruhl, Gugu Mbatha-Raw, Chris O’Dowd, Ziyi Zhang, Elizabeth Debicki, and David Oyelowo, is really top -notch. From almost the first moment of the film, however, it’s obvious the world of the movie and the movie itself share something in common: They both lack energy. The film is incredibly flat, the structure is way too familiar, and almost all of the characters are paper-thin. There are a few cool sight gags and design choices, but beyond those, most of the film is an exercise in banality. The action is sporadic at best, but even then, there’s no tension to it. And many times, what’s happening on screen doesn’t make much sense. The characters have to accomplish a specific goal, but the methods to get there feel infuriatingly arbitrary. “Close this, seal this, freeze that, why is she in there?” Most of the movie feels like it’s in there just to get the runtime up to 100 minutes. By the end, the one emotional through-line the story has been building gets an decent payoff, but it’s so tonally off from the rest of the movie, it doesn’t land. Are you asking yourself: “Does it at least connect to the other Cloverfield movies? Does it provide cool answers to its mysteries?” The answers are “Yes” and “Not really.” The best parts of the movie are when these connections are explored or explained, but the rest of the movie can’t sustain that. It’s all tangential, ultimately inconsequential, and draws focus away from the characters and a plot that’s thin to begin with. This is all very disappointing, again, because even in their underwritten roles, the cast is fantastic. Debicki, Mbatha-Raw, and O’Dowd in particular are trying their damnedest to breathe life into the film. It just so happens the script and direction simply aren’t up to their standard. I hate to bring anything outside of the movie into a movie review, but The Cloverfield Paradox is on Netflix for a reason. Until Sunday night, the general public believed this movie was going to be released in theaters April 20. Having now seen it, it’s understandable why Paramount decided maybe this route was better. The movie isn’t as innovative as the first Cloverfield, nor is it as tense and cool as 10 Cloverfield Lane. All it has going for it is this shocking release, a handful of okay scenes, and a final image that’ll provide a hearty shock and chuckle. In a theater, paying $15, that wouldn’t be enough. But, watching at home on your couch, it may just be. The Cloverfield Paradox is now on Netflix.